Sometimes companies have to change their authorized signatories for different reasons. And when such a change is made, you are suppose to be informing your bank about it. Writing a letter to change authorized signatory to the bank is a formal way of informing them about this recent change. This is essential so that there is no hassle in bank transactions because of change in authorized signatory. We have this format example for letter to change authorized signatory in bank account which can be personalized as per your requirement. We would like to inform you that as per the last Board of Directors meeting of our company held on 30.1.2018, authorized signatory for our CC Account No. 123-456-789 in the name of Weston Computer Hardware Company, has been changed from Mr. Sunny Ponia to Mr. Ankur bhatia. 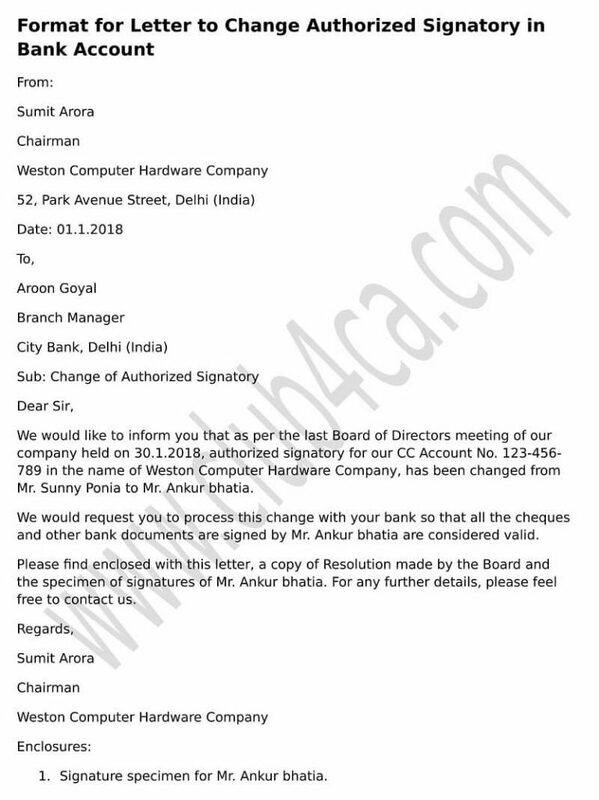 We would request you to process this change with your bank so that all the cheques and other bank documents are signed by Mr. Ankur bhatia are considered valid. Please find enclosed with this letter, a copy of Resolution made by the Board and the specimen of signatures of Mr. Ankur bhatia. For any further details, please feel free to contact us. Signature specimen for Mr. Ankur bhatia.